Contagion is proof that you can have a film without fully developed characters and it still be a thought provoking, gripping film with depth. Directed by Steven Soderbergh who made the superb Ocean’s Eleven, the atrocious Ocean’s Twelve and the average Ocean’s Thirteen (The only three movies of his I had seen before Contagion) Contagion Is an understated examination of the way in which the different levels of our society would respond to the outbreak of an unknown killer virus. 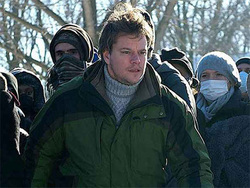 With a small cast of unknowns (Matt Damon, Gwyneth Paltrow, Kate Winslet, Laurence Fishburne, Marion Cottilard, Jude Law, John Hawkes and Bryan Cranston) Contagion is a film, which will make you think twice about touching anything. Do not see this film if you are a hypochondriac. A black screen supported by the sound of coughing is what opens Contagion and is in fact a simple representation of what is come to for its many protagonists. These characters will have no idea what is facing them but will be surrounded by its effects. As the film proceeds to show a sick Gwyneth Paltrow eat some peanuts, pass her credit card to a waiter and board a plane back home we are fully aware that something deadly has been spread due to the soundtrack and the ominous way in which Soderbergh’s camera follows the touch trail. It is not a spoiler to reveal that Ms. Paltrow bites the dust (The film’s promotional material reveals this and it happens early in the film) leaving her husband Matt Damon to desperately try and keep what is left of his family alive. It is this Paltrow/Damon plot strand that is arguably the most conventional of all the aspects covered in this multi-layered “thriller”. While no one character or story dominates the film, it is much more a macro rather than micro look upon its subject matter. Your conventional disaster movie would have Damon and his struggle at its core however in this well researched and efficient Scott Z. Burns screenplay the large majority of the film focuses upon the way in which scientists rush to find a cure and the ethical dilemmas that they face. What stays in the mind long after you see Contagion is the numerous moral quandaries that the film raises. You commonly find yourself asking, what would I do? Wouldn’t you let your fiancée know about information that could save her life, even if it was classified information, which the government is forbidding to be leaked to the general populous? Would you kidnap a member of the World Health Organization to ensure the health of your village? Would you test a vaccine on yourself first? It is these questions, which are ultimately more fascinating and gripping than the characters who are actually faced with them. The major flaw with Contagion is one that is potentially there by design yet also one that stops the film from being a visceral experience. As while Soderbergh’s and Scott Z. Burn’s unwillingness to allow you to connect to any of the characters may be complementary thematically, it does mean that certain elements of Contagion never feel as dramatic, important or as effective as they should. Contagion is a film that makes you think more than it makes you feel and while there are brief moments that send a chill down the spine or put a lump in the throat, this is a film that tantalizes the brain rather than the heart. While this may not sound like a flaw to some people, Contagion is for this reason a “thriller” without thrills. While the filmmakers original intention may not have been to “thrill” it has been marketed as such and does contain a story that lends itself to that genre. However despite the film not having that extra emotional oomph to make it a great film it is incredibly gripping. The film’s soundtrack is one of the years finest and is akin to the score for The Social Network. The techno beats give the film an energy that drives it through certain sequences. It is a soundtrack, which will enjoy a second life on your ipods and can hopefully make biology and scientific work as much fun to do as it made it look in this film. Perhaps nodding your feet and head along to something such as Contagion seems odd, yet that is what this soundtrack makes you do. Cliff Martinez certainly deserves an Oscar nomination for it however despite the victory of Trent Reznor and Atticus Ross last year, it may be too techno to get a nod. Speaking of the film’s ensemble cast it does at times feel as if these actors are being wasted. When you have people such as Marion Cotillard, John Hawkes and Bryan Cranston in a handful of scenes it does feel as if you are not maximizing the talent at your disposal. However due to the fact that the cast is filled top to bottom with superb actors, it means that there is not one bad performance in the film. While none of the performances in the film really stand out (Due to a mix of screen time and a lack of characterization), it is the performance of Jude Law, which is the most enjoyable. As a blogger desperately trying to discredit the government while adding to his credit card, his character provides one of the film’s more interesting themes. As he goes head to head with Laurence Fishburne in a TV debate, Morpheus himself proposes that what Law’s character is spreading is much worse than any virus…misinformation, paranoia and fear. The scenes of humanity tearing itself apart due to the aforementioned feelings are rather effectively done as they conjure up memories of recent events such as the London riots and reminded me of a scene from Steven Spielberg’s War of the Worlds. Matt Damon however does have one scene towards the end of the film, which is easily its most sentimental movement. As Damon’s character looks through pictures on a camera he starts to tear up and we realize we are seeing a man who is final able to mourn the death of his wife. Damon’s performance is subtler than Law’s and carries Contagion’s emotional weight. It is a rather thankless roles in some ways and an outlier among what the rest of the cast are doing however Damon makes the most of certain scenes and gives them an emotional effectiveness. Overall a refreshingly subdued nature, thought provoking themes, a strong ensemble cast, a scintillating soundtrack and dynamic Soderbergh direction are the strengths of Contagion. It may not be as horrifying, thrilling, emotional or effective as it could be at certain points and it certainly lacks characterization and doesn’t capitalize fully on the talent at hand. The film’s ending originally seemed to be heading in an overly sentimental direction (If living room proms is what they had in store as emotional content then maybe it is a good thing the film lacked it) however it then switches gears and has what is a brilliantly done, rather chilling, cyclical conclusion which was the perfect way to end the film. Subdued, thought provoking, gripping and well-acted Contagion is a film that will infect the mind yet leave your feelings quarantined. Disagree with this review? Give us your thoughts on Contagion in the Your Say section. I just saw Contagion today. Last week I saw (and absolutely loved) Out of Sight, so I was eager to see another Steven Soderbergh film. Contagion certainly isn't the best film I've seen this year, but it was still pretty thought-provoking. I agree that I was unable to connect to most of the characters, with the exception of Matt Damon. That scene near the end when Damon is breaking down was a really emotional moment. Using "All I Want Is You" made the scene even stronger for me since it's my favorite U2 song. As far as I'm concerned, Damon's character was clearly the most sympathetic in the film. YES, the score was fantastic! And I get the Social Network sound connection. Again, you should watch Out of Sight - the score is similarly effective. While it's true that there weren't any bad performances in the film, you're right in saying that the talent was not put to the best use. Cotillard's character didn't need to be there at all. Hawkes' character wasn't necessary either, though because he's one of my favorite actors (having just seen the chilling Martha Marcy May Marlene last week gave me another reason to want to see Contagion) I enjoyed the few scenes he had. One of things I was mulling over after the movie ended (and funnily enough, when taking the train home I didn't think twice about holding onto railing) was whether or not the nose spray vaccine actually worked. There was no real proof shown, was there? Also, I guessed who the culprit was from the moment I saw the footage that Cotillard looked at. I just had a feeling... so when the ending confirmed it, I wasn't surprised. With regard to the editing, the only thing I have to say is that the freeze frame moments were my favorite aspect. Out of Sight has freeze frames too, so I guess it's a touch that Soderbergh likes to incorporate. Anyway, Contagion was a good film and I enjoyed reading your review!